John was born 7 August 1864 to Cornelius McMellen and Frances (Fanny) Dart (see Cornelius McMellen 1870 Census). John T. Mc Millan died on 30 November 1926 of acute myocarditis. He is buried in Greenwood Cemetery at Walker, Michigan. 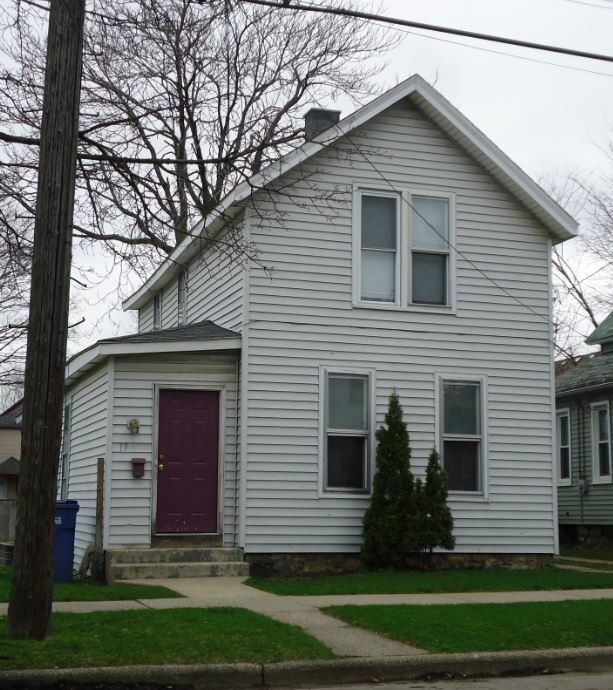 His last residence was 17 Gold Avenue in Grand Rapids. He was married to Emma at time of death. His age at death was 62 years, 3 months, and 23 days. John was born 7 August 1864 in Ohio. His father is listed as Cornelius McMillan; mother as Fannie Dart (born Ohio). He worked as a night watchman. John’s wife Emma Schooley was born to William Schooley and Sera Ball on 2 May 1867 in Ohio. She died in Grand Rapids on 15 March 1927. 1887 Marriage. John McMillen and Miss Emma Schooley were married by the Justice of the Peace on the 16th of June 1867 in Defiance County, Ohio. “Ohio, County Marriages, 1789-2013,” database with images, FamilySearch(https://familysearch.org/ark:/61903/1:1:2Q32-XVZ : 10 December 2017), John Mcmillen and Emma Schooley, 16 Jun 1887; citing Defiance, Ohio, United States, reference ; county courthouses, Ohio; FHL microfilm 1,977,640. Family lives at 17 Gold NW. Home is owned with mortgage. John McMillian. Head of Family. Age 56. Born in Michigan. Works as a watchman for the Railroad. Emily McMillian. Wife. Age 53. Born Ohio. Parents born Ohio. Asa Roebuck. Boards. Male. Age 36. Born Indiana. Works as Switchman for the Railroad. William McMillian. Son. Age 28. Single. Born Ohio. Works as Fireman for the Railroad. (Fireman was a hot, sweaty, dirty job – coal stoker). Edward McMillian. Brother. Age 53. Born Ohio. Works as laborer for a Bedding company. Helen Roebuck. Age 16. Single. Granddaughter. Born Michigan. Dorothy McMillian. Granddaughter. Age 8. Born Michigan. Emma McMillian. Granddaughter. Age 6. Born Michigan. Lulu Beardsley. Servant. Age 25. Single. Born Michigan. Housework. Family lives at 106 Wealthy av SW in a rented home. John McMillan was not living home at time of census. “United States Census, 1910,” database with images, FamilySearch (https://familysearch.org/ark:/61903/1:1:ML5P-YJ1 : accessed 23 August 2018), Emma Mcmillan, Grand Rapids Ward 1, Kent, Michigan, United States; citing enumeration district (ED) ED 53, sheet 2B, family 33, NARA microfilm publication T624 (Washington D.C.: National Archives and Records Administration, 1982), roll 656; FHL microfilm 1,374,669. Family lives at 18 Cass Street. Rental. John McMullen, head of house, born August 1862, age 37, married 14 years, born Ohio, works as sectionman for the railroad. Emma McMullen, wife, born May 1867, age 33, mother of 4 – 4 living, born in Ohio, works as dressmaker. Edith McMullen, daughter, born May 1887, age 13, in school, born in Michigan. Eva McMullen, daughter, born April 1889, age 11, in school, born in Ohio. Willis McMullen, son, born February 1891, age 9, in school, born in Ohio. Zelma McMullen, daughter, born February 1893, age 7, in school, born in Ohio. Eva Donley, niece, born July 1888, age 11, in school, born in Ohio. Alva Donley, nephew, born October 1894, age 5, born in Ohio. William Donley, brother-in-law, born May 1867, age 33, widower, born in Ohio, works as day laborer. Eugine Schooley, nephew, born September 1880, age 19, single, born Ohio, works as day laborer. 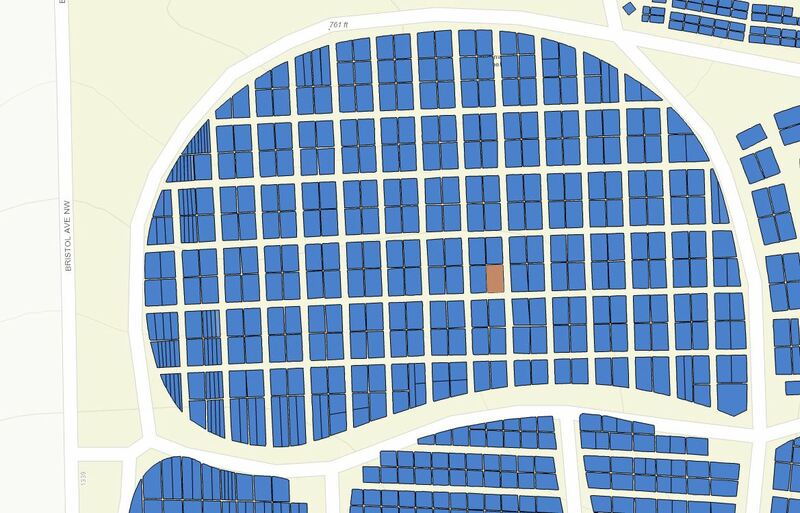 “United States Census, 1900,” database with images, FamilySearch(https://familysearch.org/ark:/61903/1:1:MMBH-BFV : accessed 23 August 2018), Emma Mc Mullen in household of John Mc Mullen, Wayne Township, Precinct 40 Fort Wayne city Ward 9, Allen, Indiana, United States; citing enumeration district (ED) 46, sheet 12B, family 253, NARA microfilm publication T623 (Washington, D.C.: National Archives and Records Administration, 1972. ); FHL microfilm 1,240,359. Wm. H. McMillan, age 20, resident of Grand Rapids, born in Ohio, who works as a teamster, married on 2 August 1911 at Grand Rapids, Michigan…Miss Hazel Walter, age 16, resident of and born in Grand Rapids, daughter of Jas Walter and Eliz Flynn. Witnesses: Wm Schooley and Ethel McMillan, both of Grand Rapids. “Michigan Marriages, 1868-1925”, database with images, FamilySearch (https://familysearch.org/ark:/61903/1:1:N3K5-8QF : 15 May 2018), Jno. F. Mcmillan in entry for Wm. H. Mcmillan and Hazel Walter, 1911. William H. McMillan, age 34, resident of Grand Rapids, but born in Defiance, Ohio, who works as a chauffeur, married on 8 July 1925 at Baldwin, Michigan…Miss Pearl Hammer, age 26, resident of Baldwin, Michigan, born in Dublin, Michigan, whose parents were William Hammer and Agnes Dell. Both had been previously married one time. Witnesses: Evelyn Hook of Beaumont, Texas, and Wm. Hammer of Baldwin, Michigan. 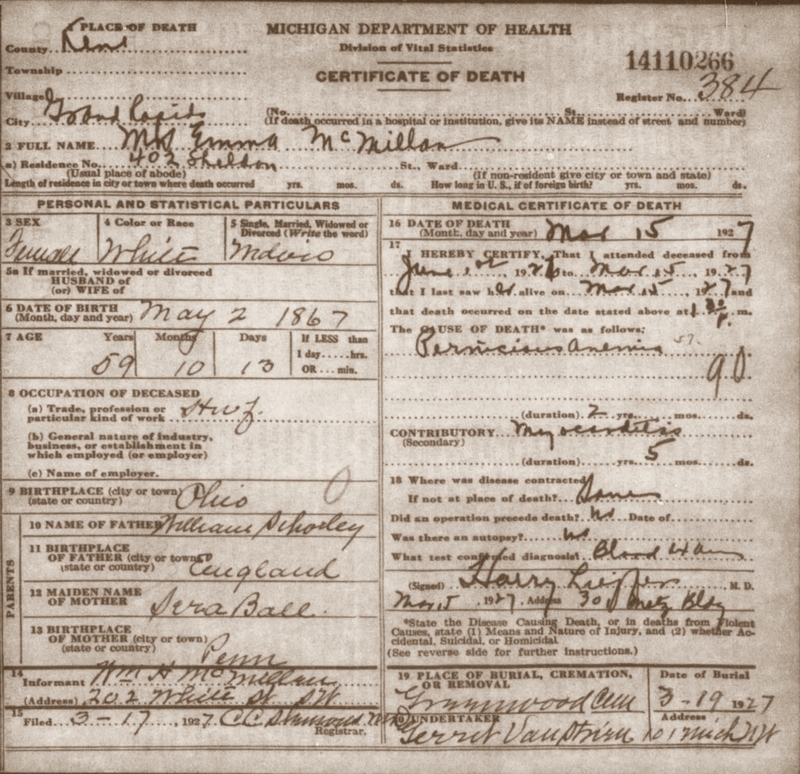 “Michigan Marriages, 1868-1925”, database with images, FamilySearch (https://familysearch.org/ark:/61903/1:1:NQ7H-YZB : 15 May 2018), John T. Mc Millan in entry for William H. Mc Millan and Pearl Hammer, 1925. Zelma Lairde McMillen, age 21, resident of Grand Rapids, born in Defiance, Ohio, who works as a seamstress, married on 17 June 1914 in Grand Rapids…Ray Nell, age 28, born and resident of Grand Rapids, a machine-hand. Both parties married once before. Witnesses: Calvin E Dart and Jennie Andie, both of Grand Rapids. “Michigan Marriages, 1868-1925”, database with images, FamilySearch (https://familysearch.org/ark:/61903/1:1:N3GS-LTW : 15 May 2018), John Mcmillen in entry for Ray Nell and Zelma Lairde Mcmillen, 1914. 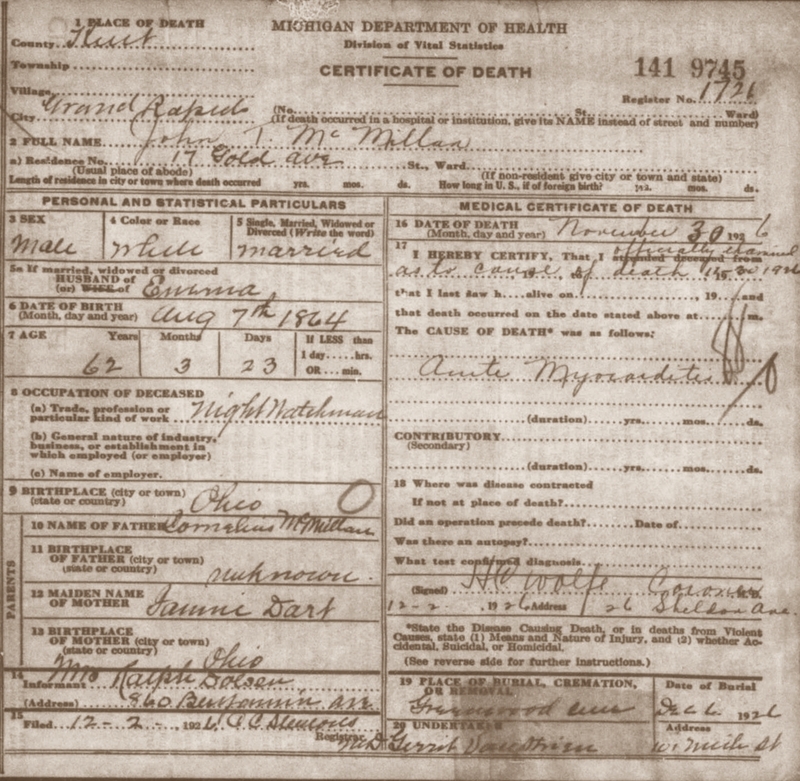 Zelma McMillen, age 16, resident of Grand Rapids, born in Ohio, married on 24 March 1909 at Grand Rapids…Jack Lairde, age 22, resident of Grand Raipds, born in Muskegon, a teamster. Witnesses: Emma McMullen and Orley Granger, both of Grand Rapids. “Michigan Marriages, 1868-1925”, database with images, FamilySearch (https://familysearch.org/ark:/61903/1:1:N3KQ-MTV : 15 May 2018), John Mcmillan in entry for Jack Lairde and Zelma Mcmillan, 1909. Eva McMillan, age 17, born and living in Grand Rapids, married on 21 August 1905 at Grand Rapids…Vernard Miles, age 25, resident of Grand Rapids, born in Ingham County, works as a grocer agent. Witnesses: Mr. & Mrs. McMillan, both of Grand Rapids. “Michigan Marriages, 1868-1925”, database with images, FamilySearch (https://familysearch.org/ark:/61903/1:1:N3FY-HLH : 15 May 2018), John Mcmillan in entry for Vernard Miles and Eva Mcmillan, 1905.